Hampton Art Blog: Two amazing card by Vivian Keh! Hi there, Hampton Art fans! Vivian Keh here today with a simple card showcasing one of my favorite cling stamps from Hampton Art against a subtle torn background. I love the beneficial insects in the garden and actually just bought a whole container of ladybugs to eat up the aphids that are wreaking havoc on our cabbages. Trick is getting them to stick around! 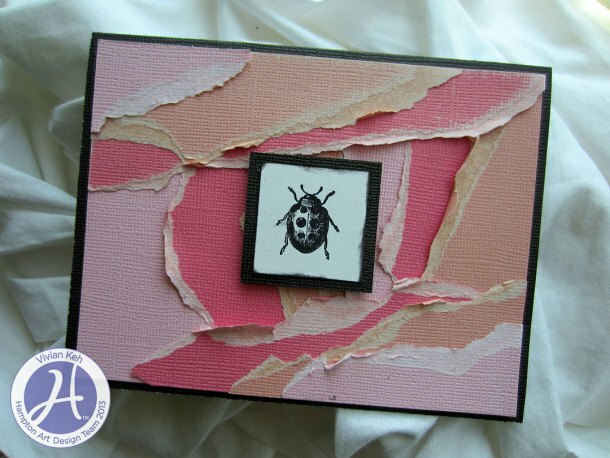 So ladybugs are on my mind and I thought I'd make a simple card honoring this little beauty. I simply stamped my ladybug on a small square and gave him the stage. 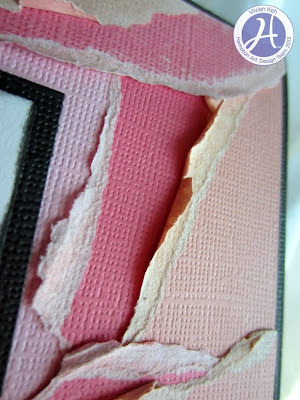 I ripped up pieces of Core'dinations Colorcore cardstock and adhered them to my cardbase for interesting and subtle texture. 1. Rip up pieces of Core'dinations Colorcore Cardstock and adhere to 5 1/4 x 4 in piece of cardstock. 3. 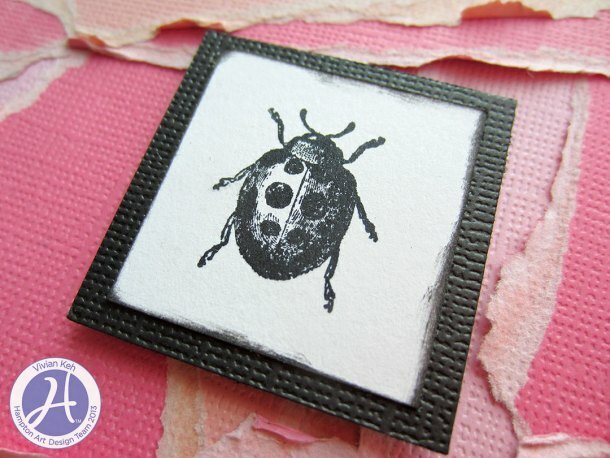 Stamp ladybug, mat, and adhere to center of card. Hi there, folks! Vivian Keh here with a quick card. I wanted to try out our Hampton Art stamps with mica powder, and I had a great time. For this card, I used the Hampton Art/ Art Warehouse PS0714 "Wings & Script" Woodblock Stamp. I love me my woodblock stamps!!! Here's the card. 1. Swirl Distress stain over white cardstock, spritz while wet, and let dry. 2. Using bubblewrap, stamp distress paint for more texture in the background. 3. Stamp butterfly with watermark ink. 4. Tap mica powder over the stamped image. 5. Softly brush off the excess. 6. Adhere to card base. Wonderful cards Vivian! Loving all the texture surrounding the little ladybug. The mica stamping gives just the right amount of bling. Thanks for sharing! thanks, sharon! the mica stamping is something new i learned from youtube - will play some more with it. 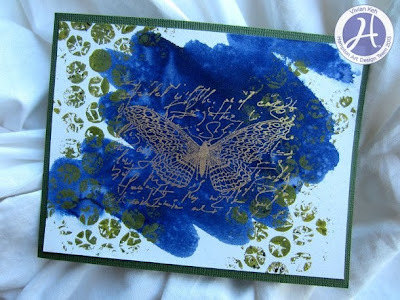 Vivian the butterfly card is beautiful, stamping with mica powder that is a new one for me. I will have to try that. 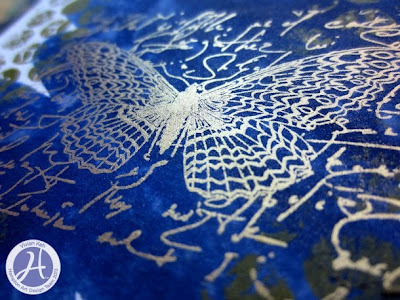 Love the butterfly stamp, I collect butterfly stamps, dies, images, butterflies are one of my symbols. thank you, jacquelene! the mica stamping is totally new for me, too! Just beautiful the butterfly card love it. thanks for the love, carolon! Hi Vivian! I like the torn look surrounding the ladybug,and your butterfly card is sparkling with beauty. I'm glad that you were able to take the time out to do something crafty for us while you are busy with your writing. many thanks, cheryl, for the support! tearing is a great release, lol, and i'm intrigued by the possibilities with that look. my written project is almost done, the first draft, that is. crafting when the writing mojo is lagging and vice versa. Metallic against velvety blue- so gorgeous!